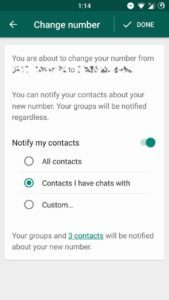 This New Update Is Currently Rolling Out To WhatsApp Beta Users And Brings A New Feature Related To Changing WhatsApp Contact Number. 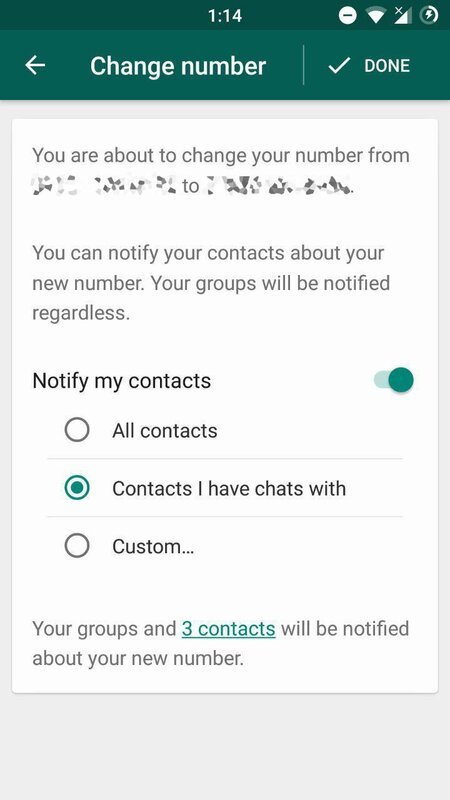 This New Feature Will Notify Specific Contacts Or All Contacts Or With Whom You Mostly Chat On WhatsApp When You Change Your WhatsApp Number. What Happens When You Change Your WhatsApp Number? For Example – You Change Current WhatsApp Number +91 ********90 To +91 ********55. Your All Chat Will Replace With Your New Number. Old Phone Number Will Be Delete From WhatsApp Or New Number Replace Old Phone Number. Previously, When A User Change WhatsApp Number, He/She Notify His/Her Phone Number Manually To All WhatsApp Contact About New Number. This Is Annoying And Time Wasting. But It Is Necessary Because, To Chat With You, Your Contacts Must Have Your New WhatsApp Number. Now, The New Update Make It Easy For You To Notify Your New Number To Your Contacts Automatically When You Change Your Number. Previously, You Go To WhatsApp Settings >> Accounts >>Change Number >>Enter Old Number >>Enter New Number >> Verify New Number >> That’s It. New WhatsApp Number Replace Old Phone Number. Now, You Go To WhatsApp >> Settings >> Accounts >> Change Number >> Next >> Enter Old Phone Number Or Current >>Enter New Phone Number >>Verify It With Message Or Call >>Now You Have To Select Either To Notify Your Contacts About Your New Number Or Not. Custom – Select Specific Contacts. This Will Notify Only To Selected Contacts About Your New WhatsApp Number. This Is Useful For Every WhatsApp User Because You Don’t Need To Call Your Contacts Or Manually Send Message About New Number Because WhatsApp’s This Feature Will Helps You A Lot. Currently, This Feature Is Rolling Out In WhatsApp Beta Version – 2.17.375 Or May Available For All Users In Future.